It’s that time of year again. Katrina at Callapidder Days has once again hosted the Fall Into Reading Challenge that runs from September 23rd – December 22nd. This is a laid back challenge where you set some reading goals for yourself. It may be a goal to read some of the books you’ve abandoned, or some you’ve shoved to the back, for those that caught your eye. You may want to read to your kids a certain amount of time. What ever you decide to do, go to Katrina’s Site and check out all of the details. I have made a modified version of this challenge for my students at school to participate in. Come join me on this wonderful venture. I will highlight the books as I read them. I will eventually write a review for all of them read. My first priority is just to get as many of them read. Next, I need to read some books toward a couple of challenges. I am signed up to participate in the Take a Chance Challenge hosted by Jenners at Life With Books. May you reach your fall reading goals! I thought I was being ambitious with 25 books, but you have me beat. Wow, that is a huge goal. Happy reading getting there! Great list! Have fun reading you! Ha! I have a teeny-tiny list compared to yours. Good luck and happy reading! You haven't heard of my list, and I haven't heard of yours (except for "I Am Number Four" which my teenager loved). But I see you promote and read a lot of self-pubbed authors, which stands to reason. Lots of reading in store for you, Sandra! 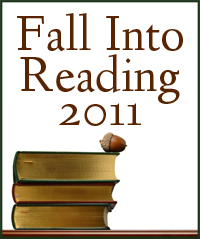 Thanks for being part of Fall Into Reading 2011 and for sharing your love of reading with your school! Wow, what a list! You are an extraordinary reader. Have fun with the challenge! What an impressive list! Good luck! I think the only book on your list that I've already read is Mockingjay. I'll be interested in finding out what ones you really like! Happy reading! Wow! That is quite the list. Enjoy your reading! Thanks for stopping by my blog. Oh my. You are going to be busy! I generally have about 50 on my list but since mine were all classics I thought that maybe I should go a bit easier on myself. Good Luck!! That is a huge list! I have put down a lot in the past, but still not that many. It looks like a great list, full of variety. Enjoy your reading!